This particular rumor is based on an erroneous news report from China Daily, an English-language Chinese news service. The report incorrectly stated that an event would be held on the South Lawn of the White House. In fact, the event, organized by the Fujian Association of the United States (according to Fox News), will take place on the Ellipse, a public park just south of the South Lawn. China Daily has since corrected its report. China Daily (July 13): The national flag of the People’s Republic of China (PRC) will be hoisted at the South Lawn of the White House in Washington on September 20, media reported Sunday. The conservative Web site WorldNetDaily reported on the original story, and the reports were then repeated on several blogs and talk radio shows. But the China Daily story is inaccurate. As Fox News reported on Sept. 4, there is indeed a ceremony scheduled to commemorate the 60th anniversary of the founding of the People’s Republic of China, but the White House says that the ceremony will take place on the Ellipse. The Ellipse, together with the North and South White House Lawns and Lafayette Park, constitute what is sometimes called President’s Park. Although the entire park is administered by the National Park Service, both Lafayette Park and the Ellipse are public parks that are distinct from White House grounds. Indeed, the National Park Service describes the Ellipse as the area "formed by an oval roadway directly south of the enclosed White House grounds." A revised article in China Daily now states that the ceremony will be "near the White House" on the Ellipse. That report came one day after WorldNetDaily posted a correction. The Ellipse plays host to a number of events each year. Some, like the annual Easter Egg Roll, are official White House events. Others, like graduation exercises for The George Washington University, are staged by private, nongovernment groups. China Daily and Fox report that the Sept. 20 ceremony is being organized by the Fujian Association of the United States. It’s also worth noting that foreign flags do sometimes fly on White House grounds, but such displays are limited to official or state visits. That includes the Chinese flag, as the picture below illustrates. The Chinese flag last flew at the White House in 2006 when President George W. Bush was in office, during a visit from Chinese President Hu Jintao. Goler, Wendell. "White House Debunks Reports It Will Fly China’s Flag on South Lawn." Fox News 4 Sep 2009. Unruh, Bob. "White House to fly Red Chinese flag." WorldNetDaily.com 4 Sep 2009, accessed 14 Sep 2009. "Chinese in Washington DC to celebrate China anniversary." China Daily 11 Sep 2009, accessed 14 Sep 2009. "China’s national flag to go up in White House on Sept 20." China Daily 13 Jul 2009, accessed via Google Cache 14 Sep 2009. 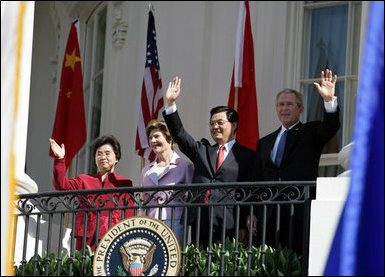 "Chinese flag to flutter over Ellipse in D.C." WorldNetDaily.com 10 Sep 2009, accessed 14 Sep 2009.